MOTU have announced three new high end interfaces offering not only class compliant USB 2.0 but Thunderbolt and AVB networking. There are several features announced which make these new interfaces particularly interesting. They all feature on board DSP with a 48 input mixer and on board EQ, dynamics and reverb. The control of the mixer, system settings and routing, rather than being controlled via a software application, is via a web app allowing control from any web enabled device over Wi-Fi. 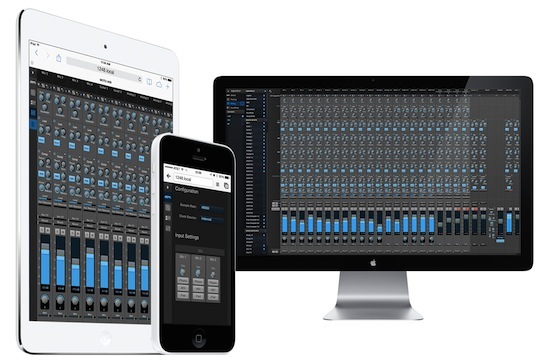 The addition of AVB compatibility allows use of several devices, connected via cat5 cables for a large, flexible, low latency networked audio solution, all controllable via a mobile devices. MOTU have announced an optional 5 port AVB compliant gigabit ethernet switch to connect multiple interfaces. Of course the usefulness of such a system is seriously affected by the 32 I/O limit imposed on non HD Pro Tools systems but the potential of systems such as these is really interesting. The potential for AVB interfaces to be distributed around a building via cat5 with web based control via Wi-Fi sounds exciting to me. If you don’t know about AVB take a look at my two part series on networking and audio Part 1 and Part 2.